Who remembers Pixel Press in the old days of Habbo? If you don't remember then its most likely you weren't around Habbo during that time as it did happen quite a number of years ago. To summarise it quickly, Pixel Press was a weekly newsletter published by Habbo in which users can submit their own original articles, poems, jokes, etc. The selected entries would be put onto the offical Pixel Press homepage for all others to see. Likewise, Weekly Bites will be somewhat similar yet different also. Weekly Bites will give you a nice little recap on what has been going on in HabboBites as well as the opportunity for members to submit their own content to be included in the next addition of Weekly Bites. Successful participants will be rewarded with some bites points, depending on what content they send through! 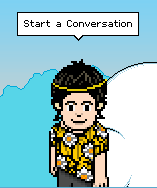 #Relatable (10 points): users can submit their own Habbo experiences and we'll see if we can relate to it! Random Recommendations (15 points): if you'd like everyone to know about your favourite book, film, etc then write us a thorough review on why we should check your recommendation out! Before you participate, please make sure you read the guidelines (listed below) carefully as we will not accept entries from participants who do not abide by the guidelines. Put your writing to good use! Are you ready to be on that podium? Should we change our site name?